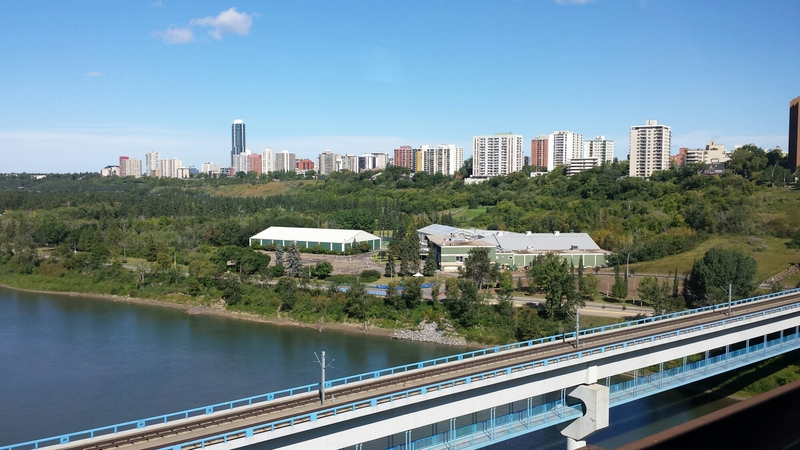 Watching Top Gear tonight and their trip to Canada made me reminisce about my trip to Edmonton last year and also reminded me that I hadn’t written anything here for a couple of months. As my race number for the MK half dropped through the door this week it seems quite timely to update what is going on in my world. Anyway, after the MK Winter Half in December, I took some time off from running, ramped up the physio and have spent most of the winter doing strengthening exercises. Touch wood, the problem has eased massively but I’m nervous about next Sunday. It’s so early in the season and I’ve lots planned so first sign of trouble and I’ll be backing off! Aside from my running woes everything else is going pretty well. I decided at the end of last year that I wanted to have a bit more structure to my training so have teamed up with Adam from GreenlightPT and it’s already working wonders. My time off the road has been well spent on the bike (mostly the turbo thanks to the wonderful British weather) and in just 8 weeks I managed to increased by FTP by 10%. I also decided to treat my swimming with a bit more respect, rather than the necessary evil that triathletes have to endure and have made some big gains in the pool over the last few weeks. I also treated myself to a TT bike. After my son started school in September I decided to up my hours at work back to full time and along with an unexpected pay rise, the extra cash was burning a hole so I now am the proud owner of a Planet X TT. It’s still sat on the turbo but as soon as the weather clears up we’ll be whipping up and down the lanes of North Bucks and South Northants. I know it’s all about the engine that drives it but to quote a well known supermarket ‘every little helps’! So the next few months will be a lot of hard work to get ready for the ITU qualifiers, Outlaw Half and the ETU Champs in Geneva. 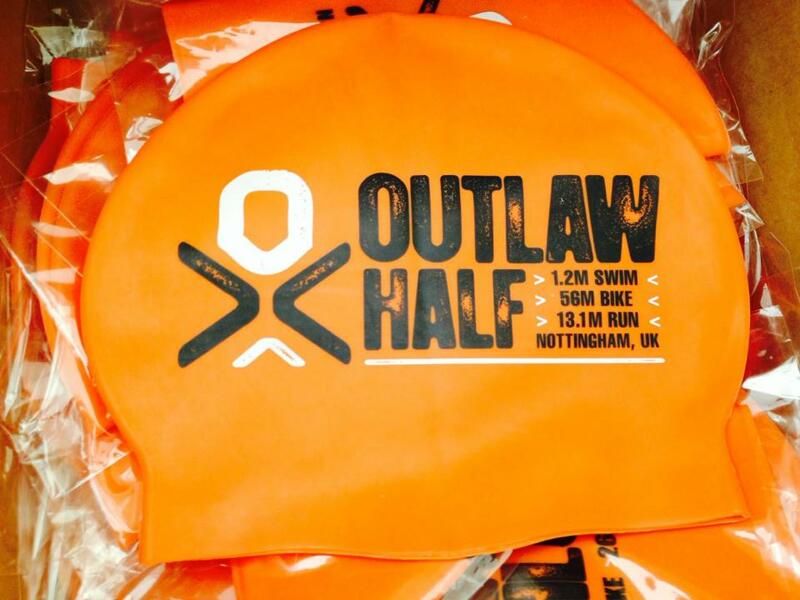 I’m really looking forward to Outlaw. With an improved bike leg I know there’s gains to be made as long as I can run comfortably. I’ve no idea how the qualifiers will go. I’m now the baby in a new age group with the over 40s – I only turned 39 10 weeks ago so have no idea where I sit in the scheme of things, and am very conscious of the fact I got lucky with my qualification for Edmonton last year – hopefully luck with be with me again this year! Week 16 was the final recovery week before the taper starts and what better way to start a recovery week than a race! 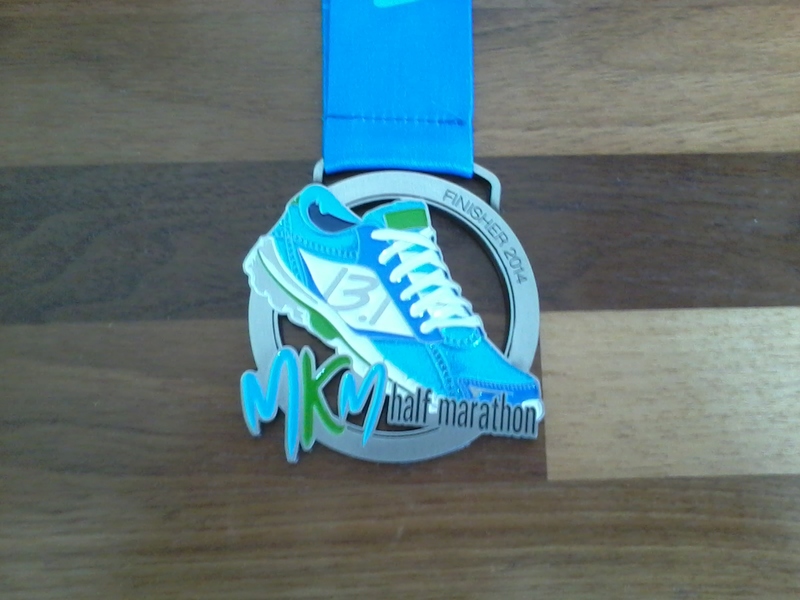 Bank Holiday Monday was the Milton Keynes Marathon and Half Marathon and I ran the half and ran myself into a new half marathon PB. The downside was the pain in my achilles and calf I felt towards the end of the race didn’t disappear with the other achey muscles and by Thursday I was at the physio. 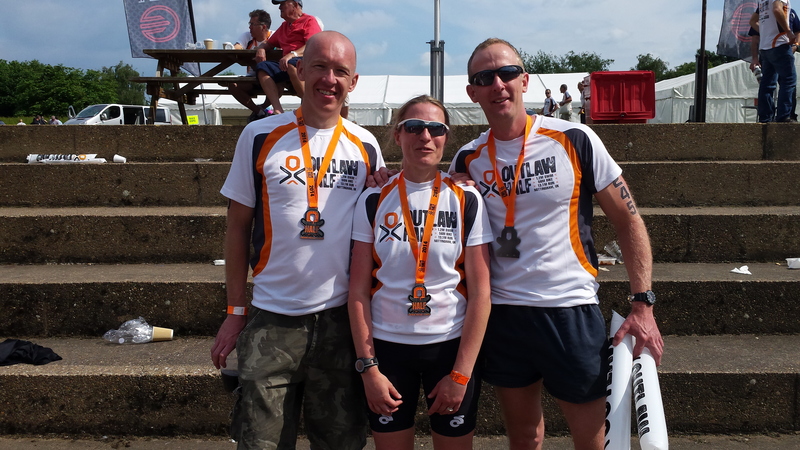 The muscles were so tight to continue running would be asking for trouble – with the St Neots Olympic Triathlon booked for the Sunday it didn’t look good. 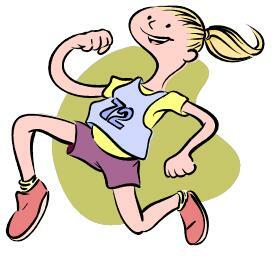 After been told I shouldn’t run for a few weeks I mentioned that fact I was due to race and was told I could race but shouldn’t really run – although if it felt ok after a short test run on Saturday I could take it slowly. Probably didn’t help matters that I took the day off on Wednesday and went out with the ‘Wednesday cycle group’ – a group that my father in law rides with – they do push the speed a bit but I felt I needed a bit of a test after a relatively slow ride to the Beacon the previous weekend. It was also the day the Womens Tour of Britain started and came right through Northants finishing in Northampton – just up the road from me – so the route for the group was a trip to the Dairy Farm at Upper Stowe then a saunter across the other side of the A5 to Kislingbury to catch the peloton as they raced past. I struggled to start off with as I still had the tough half marathon in my legs but once I got going it wasn’t too bad and it’s not every day a major cycling road race passes through your manor! by the end of the ride I’d another 47 miles under my belt. With no running possible I did an 40km on the bike on Saturday followed by a 10 minute easy jog to test my leg. It didn’t feel right but wasn’t painful so I resolved to race at St Neots but decide on the run when it happened. 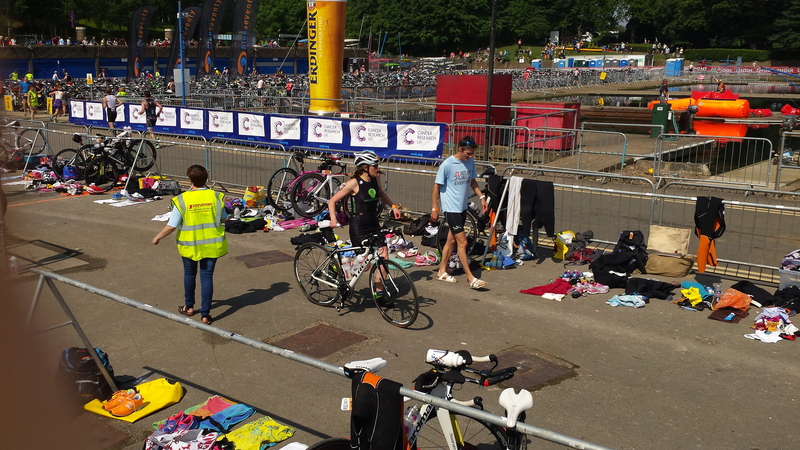 The St Neots Triathlon is one of the first open water triathlons of the season. Run by NiceTri Events it was the first time I’ve taken part. We had a 150om swim in the River Ouse, followed by a two lap bike that headed out towards Grafham Water before takinig in a bit of a hill at Little Staughton. The run was then a four lap run around the Riverside Park. The race was supposed to be a bit of a warm up for Outlaw, a chance to race half the distance a few weeks out but to be honest with my bad calf I realistically knew I couldn’t race it so my heart wasn’t really in it. I enjoyed the swim and felt I’d swum well coming out of the water quite well up. It was very cold so I struggled to get bike shoes on and then just couldn’t get warm on the bike. I struggled big time and spent most of the bike leg being passed. I got back from the bike leg and started on the run but it was clear after a lap that I probably shouldn’t continue. The ground underfoot was a mixture of path and grass so wasn’t the best mix of surfaces if you have a dodgy calf. My leg didn’t hurt but wasn’t right – after one lap I pulled out. Not how I wanted to end the day but there was no point making it worse. On the upside I did get a chance to cheer on the others which was great. Week 17 was the first week of taper – same training sessions but turbo brick changed to a ride and I exhanged interval session for a physio session as I couldn’t really run. 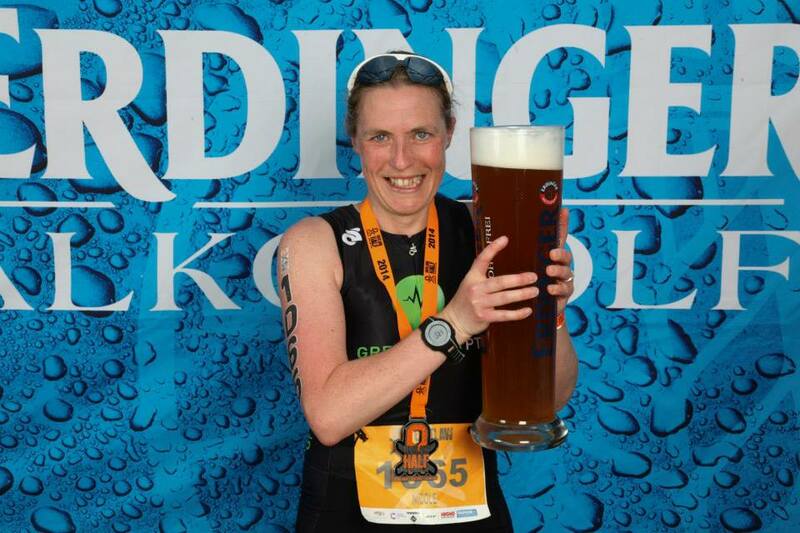 I needed an easy week as I think as well as being injured I’d still managed to over do it – 160 miles of cycling plus a hard half marathon and most of an Olympic Triathlon. I did have a long 80km ride/run to do which went really well – I used it to test out my nutrition and managed to get a reasonably steady 3km run done after. 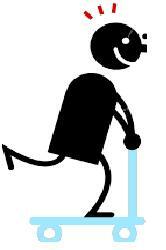 I rounded off on Sunday with a quick lake swim and an easy 4 mile run – leg was ok but still not right. Week 12 was a recovery week – all the usual sessions but without the brick runs and a much shorter ride and run at the weekend. Week 13-15 was the start of the second block of build weeks. Longer brick runs and the rides building up to 90km all followed by a run. 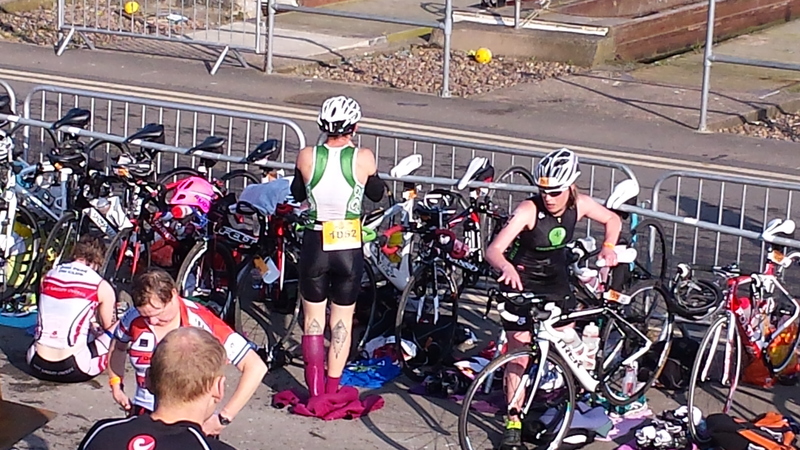 At the end of week 13 I also took part in my first triathlon of the season at Duston, which as I’ve already blogged about was a great success! I also took another swim clinic with GreenlightPT as it had been a few months since my last one. I had been working on the various points that Adam had picked up last time with my head position, cross over on my pull and my exit on the pull so was keen to see if I had managed to fix these issues, plus the session always has a few time trials to check on performance. I am pleased to say I had improved on all counts and my 400m TT time was a season’s best by some way and not too far off my overall PB. As ever though I came away with more to work on and a super tough endurance session that has really made me work in the pool. Week 15 was rounded off with a full length 90km ride followed by a short run. I wanted to try to build a hill into the ride similar to the main hill at Outlaw and received a variety of suggestions, one of which was Ivinghoe Beacon, which would be around 50 mile round trip from home. I’ve never ridden this hill before so thought it would be a good one to try. Just to make the day really tough it started early in the morning at Box End, near Bedford. A quick lap of the cable lake – my first open water dip of the year – before heading home for a quick bowl of porridge and out on the bike. I rode alone as my brother-in-law, who I normally cycle with has injured his hip and was unable to ride but it was a good test for me as I have to ride alone at Outlaw. It made for a tough ride as it was quite windy in places and although the only notable hill was the Beacon, there were a few undulations out there to keep the legs burning, but took me through some beautiful countryside before the climb up to the Beacon. The inital climb starts down in the village of Ivinghoe – I started the gentle incline strongly when a 4×4 decided to come round me and slam its brakes on – no idea why but the end result was me in a heap in the road still attached to my bike and said 4×4 driving off. The road was quite a busy B road so I didn’t want to be lying in the road for long, but typically couldn’t get my shoes off my pedals as I was lying down and then realised my Garmin was still going! Not sure what concerned me more, lying in a main road or the thought of my Garmin still running. Either way, I resolved both situations swiftly. A couple of drivers had stopped to check I was alright. Luckily no damage to me or the bike that I could see, although I was concerned about my new trisuit which I was testing as I had landed heavily on my side. I dusted myself off and continued on my way, a little bit angry at events – I have no idea what the driver thought they were doing but they clearly had no concept of other road users, particularly cyclists and it was clear why so many accidents happen. With the bit between my teeth I took the Beacon by its horns and had a nice steady ride to the top – even passing another cyclist on the way. It wasn’t as bad as I had been led to believe – quite long, but more of a gentle drag than a major slog. It kicks up a bit towards the end but the views you are rewarded with on the way more than make up for it. I stopped at the top to have a check I was alright after my fall and I could feel my left leg had taken a bit of a bashing – nothing too serious but could feel there would be bruises in a few days. From the top of the Beacon I was a bit hazy about the route back down to Ivinghoe. I could return the way I came but wanted to take a more scenic route through Ashridge Park, down Tom’s Hill and through Aldbury (anyone who watches Midsomer Murders will recognise it) – only problem was my phone couldn’t get a signal so my route wouldn’t show. i decided to play it by ear and make it up as I went along. I knew roughly where I wanted to go so set off down through the Park, eventually arriving at the top of Tom’s Hill (glad I didn’t come up that!) and descended into Aldbury. From Aldbury I found a signpost that pointed to Tring (wrong direction) so took a punt on a random road that I thought headed in the right direction – luckily it did and I found myself back in Ivinghoe village and on the route home. Although hit wasn’t particularly hilly going home it did feel like a long slog but gradually the miles ticked over and I reached home in 61 miles. A fair bit over the 90km I was supposed to do but with a few stops I figured it had evened itself out! A quick run after to round of the full triathlon day and that gave me the confidence to know I can complete the Outlaw Half. I was looking forward to this run, first time I’ve actually really looked forward to a running race in a long while. My training for the Outlaw Half on June 1st has been going well and my long runs have been much quicker than anything I’ve done in the past, and all done on tired legs following a long ride the day before. So, with a day’s rest before the race I knew this could be a PB potential race! My current PB for a half is a touch under 1:46 and based on what I’ve done in training I knew that was a good realistic target. As always the day started with a team photo. DLRR met outside McDonald’s at Stadium MK, home of the MK Dons although without our revered leader (he was managing the marshals today) it was a somewhat less formal affair – no idea who actually took the photo, but it appeared on Facebook during the event so the result was there! The Milton Keynes Marathon is now in its third year. After marshalling the first year in torrential rain, running the marathon in a heat wave last year, I jumped at the chance to run the half when they introduced it this year. You get all the camaraderie of a major marathon, but only half the distance to run – what more could you ask for? The course for the half followed the same route as the marathon until just before the 10 mile mark when the marathon runners turned off to continue along the city redways while we continued to the stadium to finish. Stadium MK is a great venue to start and finish an event – plenty of parking, as many toilets as you could want (all very clean!) and loads of space for runners and supporters. The start was a short walk away from the stadium on one of the main roads heading towards the city centre. There were no waves this year so runners were free to start wherever they wished. This was good news for me as I was keen to run with the 3:30 marathon pacer (8 min miles). I headed to the start and tried to look the pacer out – all the pacers had big blue balloons so they could be spotted easily, except I could only find the 3:45 guy – there were two other pacers near the front that I could see but hadn’t got a hope in hell of getting near enough to find out whether that was the one I was looking for. I decided to just pace myself and see if I could stumble across the pacer early on in the race. With the course doubling back quite a bit in the early miles I knew I should be able to spot him. The first couple of miles follows one of the main city roads up towards the City Centre. It’s a gradual climb so it’s good for keeping the pace in check early on. The first of the loop back sections came just before we entered the City Centre and was a good chance to check where I was in the scheme of things – plus I spotted the 8 min pacer – he was quite some way ahead of me so I doubted at that point I’d be able to catch up so I decided to carry on as I was. Miles 3-7 consisted of loops of the City Centre grid square. It sounds bad on paper but in reality it was great – the terrain is undulating – we entered the City at almost its highest point and ran down almost to the station before running back up and looping around the various boulevards. For a club like DLRR it’s a bit like a normal Sunday run – we loopback to the slowest runner to keep the group together – it’s a very social format and I spent most of that 5 miles waving and shouting at fellow runners as we spotted each other across the carriageway! All this joviality meant I wasn’t clock watching too much which is no bad thing as the undulations meant my mile times varied by over 30 seconds but I was making good time as we left the City Centre and headed back down the main road towards the stadium. The road out of the city was a nice long downhill and gave me a chance to stretch my legs a bit and see how I felt – still plenty of running there – I could also see the 8 min pacer getting nearer – I was averaging well under 8 min miles and even by mile 8 I hadn’t caught him so not sure how far under he was! At the roundabout before the stadium the course turns left and heads along the V9 Groveway – a road I know well as I drive along it every day on my way to work at the Open University. It starts nice and flat then as you approach the river Ouzel it swings down before sweeping back up past the OU. We had to run the length of it as far as the roundabout before taking a U-turn and running all the way back again. It was a great opportunity to see other runners coming the other way – I could see the top end of the half marathon race heading back towards the stadium. At about 8 1/2 miles I finally caught up with the 8 minute pacer. I was actually travelling faster than 8 minute pace now so swung straight past his group – best laid plans and all that! About half a mile after the U-turn the marathon and half marathon split with the long haul guys heading off onto the redways and the half marathon continuing back towards the stadium. Once the split occurred the road suddenly thinned out and first time I ran on my own for a bit. We climbed back up the road and headed towards the stadium but as we’d only reached 11 miles we had to run back past the stadium and round a small lake before running back up to the stadium again. This is a little disheartening as you can see the finish area and people already running towards it, but you have to run right on past it…it was at this point that I could feel my calf and achilles getting really tight – almost cramp like. I felt like I had loads left in the tank but couldn’t up my pace too much for fear of doing some damage. This isn’t my A race of the year and I couldn’t afford to take the risk. It got to the stage where almost every step sent a pain up my leg, made even worse when we left the road to run round the lake. This was on footpaths that weren’t in the best condition, not good when your leg is on the verge of cramping up. Nevertheless I stuck with it, I knew I was on for a PB, but not sure how much. Somehow I managed to churn out a 7:30 mile just before the end and held on. The run out into the stadium is magnificent – for a reasonably small club the stadium is large – Rugby World Cup matches will be held here in 2015 so it holds a fair few people. Nowhere near full today but enough to make a noise to get the heart pumping. We had to run around three sides of the pitch to finish – never has a football pitch seemed so big – but I managed to step up a gear and cross the line in 1:42:18 – a new PB by well over 3 minutes! I must add that the marshals and volunteers out on the course and at the stadium were amazing. There were loads of them and were all very vocal – although it helps that a lot of them were from DLRR! Having marshalled a few years ago, I know what a long day it can be and they did a sterling job. Some of the best in the business – and I’ve run a lot of races over the years to know that! 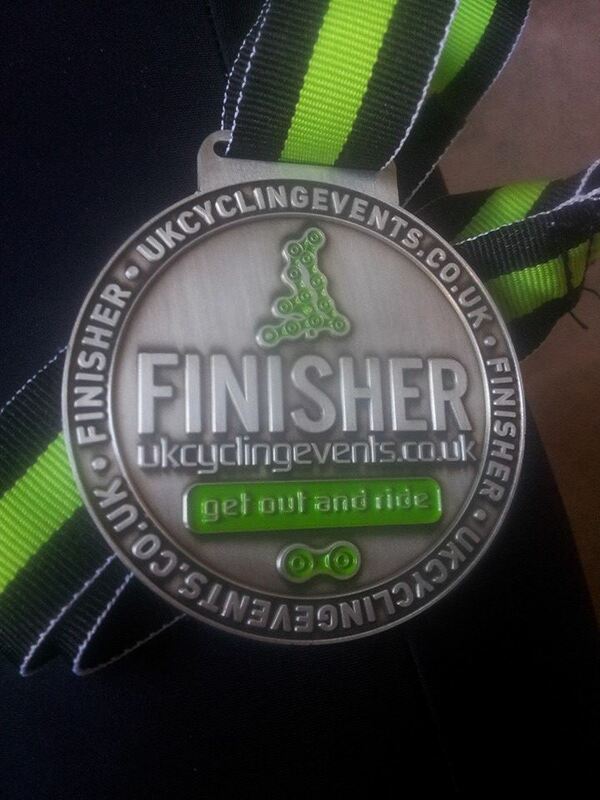 The medal – one of the best I’ve got in terms of design! Turbo on Monday was a tough start to the week as usual, especially following the Cobbler from the previous day. We finished with some core work and I then ran 3km to make it a brick session. The GreenlightPT swim session was a toughie and one of the hardest I’ve done (20x100m). The pace was 400m PB pace which sounds easy enough but not when there’s 20 to do and there wasn’t much rest involved. But I did them all, and got rest and gave a good indication of the what might be coming up as this training plan really gets into its flow. My early morning swim session on a Friday is now a firm fixture and I actually quite enjoy starting the day with it. I usually do some 400m reps and my times are now consistent so the endurance is coming together. This is also the chance for me to work on specific drills that have come out of my swim clinic. Saturday was my first long bike/short run brick sessions. It looked chilly outside but wasn’t. With not enough water and being rather overdressed so I struggled towards the end of the ride. Once home a quick change and I was out for a run. I was quite pleased to be able to keep a reasonable pace. The first kilometre was tough but I was surprised how quick the legs responded and recovered to run normally. Following the hard run the day before my knee still felt a bit tender so for a change I listened to my body and took my rest day a day early, but missed my turbo/run session as a result. By Tuesday it felt a lot better so took my bike out, with its new tribars for a quick spin up the road and then a quick 3km run after so this made up for the missed Monday session. I swam as usual on Wednesday but had to miss my interval session on Thursday as the other half was really late home from work. 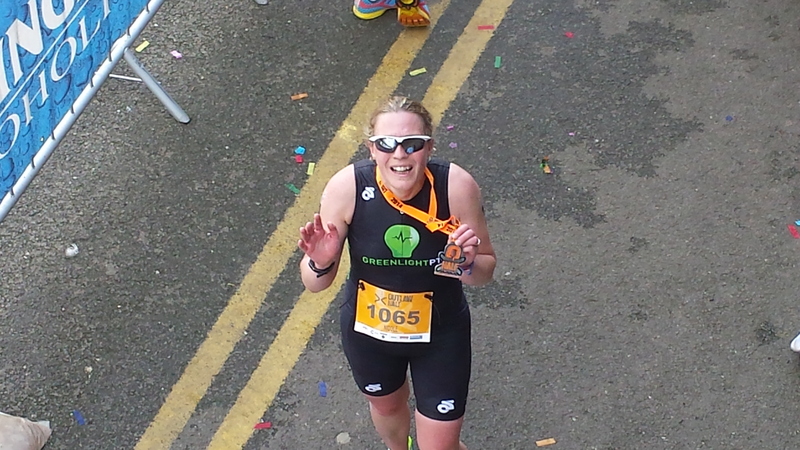 With the GreenlightPT 70.3 Training Weekend this weekend I decided to miss my Friday swim session and went out for a run instead as I knew we’d be swimming on Saturday. The weekend was consumed by the Training Weekend – a post covering this will follow, but it is fair to say – it was a full weekend of training! Another ‘solid’ week completed with no major catastrophes – well to me, my new bike isn’t so clever but that’s another story! The week started well with a tough turbo session – lots of hard riding followed by hard running and rounded off with transition practice. I followed this with a quick run and was surprised how well the legs worked considering the battering they’d just received during the previous hour. Wednesday night was the usual GreenlightPT swim session and was our 6 weekly 400m time trial. I’ve felt I’ve not performed particularly well at these over the last few months. The problem being towards the end of last summer when we did the first proper time trial I managed to post a massive PB, mostly helped by the fact I was able to draft for most of it. I’ve spent the last six months not getting close to it – but in my head that PB is now written off and this week I got a new PB – not a million miles off the old one, but a much more realistic one to work to. The rest of the week went as planned – I did my long run on Saturday as I did a sportive on the Sunday and felt like I was flying – amazing how different it feels to not run on tired legs. Sunday was the ‘Cobbler Classic‘ a new sportive covering South Northamptonshire and started from Towcester Racecourse – just a few miles from my front door. 60 miles in rather cold and windy weather and finding some hills that I didn’t know existed. It was a tough, tough ride – particularly over the first 25/30 miles – constant undulating terrain battling the wind. It was a bit of a reality check – although we tried to schedule in food stops, they weren’t enough and the final 10 miles were a real struggle – not helped by a long drag into Whittlebury from Stowe. But I got round and despite several stops for food I managed to gain a Gold Award. Wasn’t the quickest ride in the world but a great experience and would definitely recommend this sportive for next year. With a choice or 39, 60 and 80 miles there’s something for everyone. The medals weren’t half bad either! 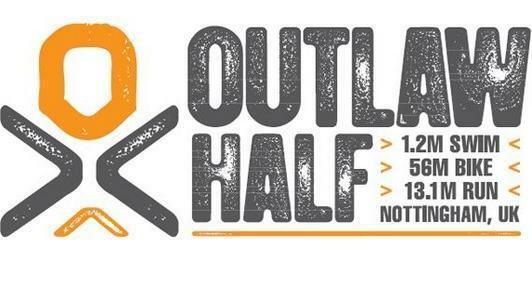 Outlaw Half Training – Week 8 done – boom! Bit late with this weeks round up so I’ll try to keep it short and sweet. Hit a few brick walls in some respects, but also made a massive breakthrough as well. Turbo with GreenlightPT on Monday had the usual mix of hard cycling and some transistion training. 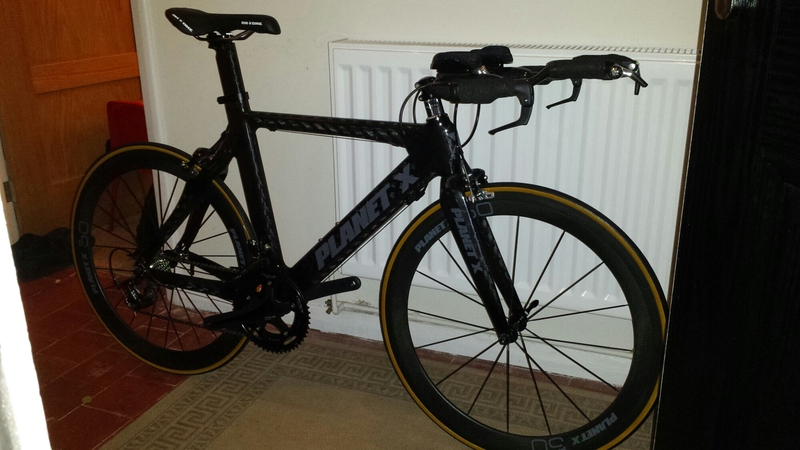 I can now run with my bike – it’s not as hard as it looks and will be trying it out at a triathlon in the near future. We also did some dismount practice – I realised very quickly that my confidence on the bike is severely lacking – I’m ok riding but getting on and off at speed I really struggle with – so much so that I now have bike homework – scooting on my pedals! Swimming on Wednesday was a solid session – I don’t feel I’m getting any quicker, but I am getting stronger and can maintain a good pace throughout when others are dropping off so I’m hoping that is a good sign and will help with the 1.9km swim that starts the Outlaw Half off. I’m getting into the habit of a second swim session a week now and I’m hoping this will start to pay dividends too. Others seem to be swimming a lot more than me but in the scheme of things I’m getting by on two sessions a week and when you think the swim is only a fraction of the full 70.3 distance I think that’s enough. My ‘boom’ moment this week was my tempo run on Thursday – as week 8 was a recovery week there were no intervals, just a zone 4 6km run. My running club regular route is a 4 mile loop and a great gauge of where I’m at. Four weeks ago I ran my equal fastest time on this route but still felt there was a bit more in the tank so this week, I went for it. I was helped by the fact there were a few of the quicker runners there so I hung onto them for the first mile and settled in. I knocked 1m 30 off my time of four weeks ago and ran every mile at exactly the same pace – to the second! Boom! I’m so pleased my running is back on track – after what seems a lifetime of niggles and injuries I’m hoping I’ve turned a corner and can get back to a decent level of running as I always felt I’ve never quite fulfilled what I can actually do in running terms – I know I’m never going to be as quick as I was as a teenager but I’d like to think I can knock out a few PBs this year. 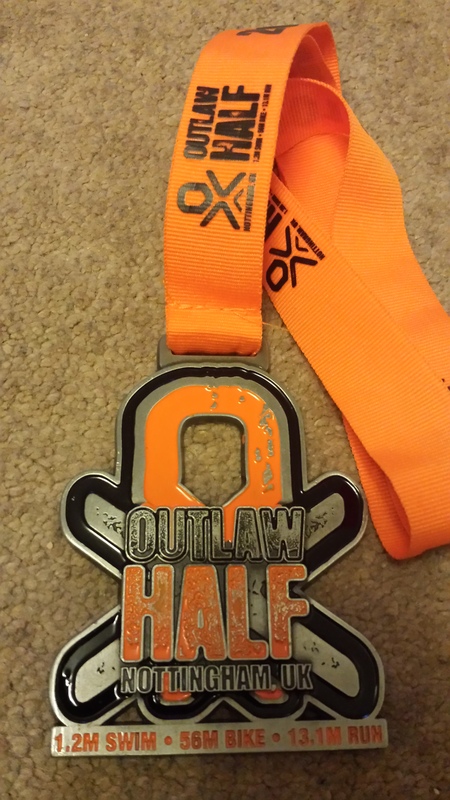 I’ve got a few targets in mind, some of which I’ve shared as it’s a good way to motivate yourself to achieve it, but there are a couple more lurking that I’ll have a pop at, at some point – but all can wait till Outlaw is over. I had a reasonable ride at the weekend. The weather was lovely so my new bike came out to play – unfortunately it didn’t sound to clever so after 10 miles of pootling and trying to rectify the problem I just decided to ignore the annoying chain noise and get stuck in. My planned 24 miles turned into 34 – oops! It’s such a nice ride – I just need some more decent weather and we’ll be back out again soon! I rounded off the week with a short/long run – only 7 miles but was nice and steady and in the early morning glorious sunshine. Almost half way in the plan now and from this point a lot of the really hard work starts. Hopefully the first eight weeks have given me a good enough base to build on. My swimming is getting stronger, my bike is ticking over and my running is coming on a treat – just need to learn how to put it all together (and scoot on my pedals)! A good solid week of training was achieved this week and I managed to tick every session on the plan off, although not quite gold star material as I only ran four of the five intervals I should have on Thursday (the fourth was so bad, I gave it up as a bad job!). The week started well with a good turbo session with the GreenlightPT crew. We started with a killer of a pyramid session followed by a brick set. I was quite pleased with my running off the bike – considering I’d run 12 miles the day before the legs moved quite well so they’re definitely getting used to trauma of running straight after a ride. I followed the session with an easy 3km run which was a good way to run off the previous days run and the pain I’d just put them through. Swimming on Wednesday was good – feel like I’m getting my swimming mojo back again after a bit of a lull – felt strong throughout the session and am relieved that the pain I had in my shoulder is lessening as the weeks go on. Can only assume it didn’t like the increase in training and introduction of core work! As I mentioned earlier, my interval session on Thursday was not 100% successful. As with last week I had to do the intervals up and down the A5 which is not ideal. 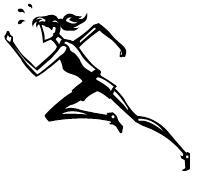 It’s difficult to get any sort of a rhythm going as you’re either running uphill, downhill, crossing a road or turning around. I’ll be pleased when the lighter nights return so I can go and use a great 1km straight we have just outside our village – could have been designed for interval work. I finally managed to get my second swim of the week in on Friday morning – I hadn’t been able to try the endurance session yet so gave it a go and was quite pleased with the outcome – all reps in under time and without too much effort expelled – it did help having two bloke ironman training hanging off my feet as it forced me to keep an even pace which is no bad thing. With the MK Half on Sunday I only had a reasonably short bike ride to do (50km) on Saturday so tagged along with my father in law and brother in law en route to some hill training – thankfully I got to turn around before they hit the bigger hills although I was faced with my other nemesis on the way home – the wind! Made my planned fun ride home a long slog – not perfect preparation for a race the next day but hey, that’s what training is all about! After a pretty much non-existent week of training last week, things are picking up again. I’ve still got my cold (I never have one of those few day colds that others seem to have) but it’s not on my chest so pushing on with the training! Back into the turbo session with GreenlightPT on Monday. It was a great brick session with reps on the bike followed by runs round the block. My first foray into brick training this year and the legs weren’t sure what had hit them – especially as one of the reps involved a running parachute! It must have given various passers-by a giggle. But it got me working up a sweat so must have been doing some good. Life got in the way on Friday with a poorly little boy and a husband away with work so unfortunatetly my second swim session was canned. I hoped to make it up on Sunday evening but just never happened, just need to make my next swim session better to make up for it. The weekend was probably my biggest yet in total distance covered. Not my biggest ride but was the largest bike/run combination over two days. I didn’t go out with my usual group on Saturday morning. It was quite icy, even at 9am and as I don’t do ice (ever) a mile out of my village I chickened out and came home. I eventually ventured out at around 10:30 and had a pootle around the lanes. It’s always tough out on your own, the miles seem to take so long to stack up and you never travel as fast. I was quite grateful to ride for about 10 miles with a fellow cyclist who I’d caught up. We had a nice chat which made the miles go past quicker, even though the speed wasn’t so hot. After I left him in Fringford I pushed hard for few miles to make up some time and was quite pleased with what I could do – the lack of headwind did make a difference! for the second week in a row I avoided a cafe stop, but as a result did need to stop to take a gel. I need to start to take on food a bit more on the go as it wont do the bike split much good to be stopping for tea and toast. Sunday was a long run – I had a target of 12 miles on the plan and the DLRR club run was an hour or 2 hours 20 mins – I needed a bit in between that so ran five miles on my own and then ran an hour with the club. It was great to be back running with the guys again and I quite surprised myself as how quickly my running has come back together. With the MK Half next week it could be an interesting race. It is just a training run, and I don’t think I’m in PB shape but sometimes once you get going you feel it’s there – I’ve got my game plan worked out for a conservative start and finish strong, but I’m terrible as sticking to my preconceived plans…so roll on next Sunday.